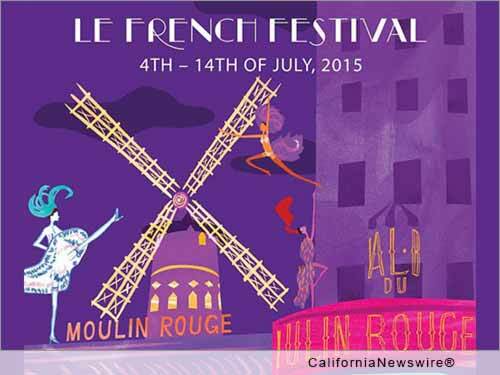 LOS ANGELES, Calif. /California Newswire/ — In a celebration of French artisans and culture in Los Angeles, Selavi Global and Canard Duchene Champagne have teamed up to launch the brand new "Le French Festival" set to take place across Los Angeles from July 4-14, 2015. The event will end with a closing night party produced by French Tuesdays on Bastille Day, July 14 at Riviera 31 at the Sofitel Hotel. During the ten-day celebration, a number of small, French-run businesses and merchants will present visitors with a passport that provides access to free workshops, demos, tastings, champagne, discounts, and entry to the big Bastille Day Celebration on the evening of the 14th. Anyone who visits a participating location will pick up a passport and receive a sticker for every purchase made at a participating venue during July 4 to the 14th. Once visitors have collected five stickers, their entry to the closing night event is free. With over twenty-five participating businesses specializing in beauty, art, food, fashion, and more, including Fred Segal Mauro Cafe, Please Do Not Enter Gallery, Crepes Sans Frontieres, Pure by Michele, Hale Bob, "Why La? Pourquoi Paris?" and Mervetty Bakery, Angelinos can enjoy the French way of life in their own backyard. "We welcome the opportunity to be part of an event that celebrates French culture and excellence in the City of Angels," said Nicolas Libert, Owner, Please Do Not Enter Gallery. "Our aim with this festival is to invite locals to experience French culture in Los Angeles and to showcase the many businesses that contribute to the city's fantastic art, fashion, and food scene," said Gilles Amsallem, Festival Founder. "The French American Chamber of Commerce is thrilled to be partnering with this initiative. The Bastille Day Festival is representative of the growing influence of French entrepreneurs within the Los Angeles Area," said Samuel Loy, Executive Director, FACC Los Angeles. "With this new Le French Festival, we are bringing Paris to L.A. and inviting locals to celebrate and experience French culture without hopping on a plane," said Francois Peltereau-Villeneuve, president, Thienot Group USA. "I'm thrilled to be part of 'Le French Festival' that celebrates French culture right here in Los Angeles," said Gilles Marini, L.A.-based French Actor. LE FRENCH FESTIVAL is a ten-day festival that ends with a closing-night event on July 14, 2015, Bastille Day, and highlights the city's cultural diversity by showcasing Los Angeles-based French-run businesses. Presented by Selavi Global and Canard Duchene Champagne in coordination with the French Consulate and the French American Chamber of Commerce, it is designed to generate awareness and stimulate business for merchants located in Los Angeles. For more information visit: http://lefrenchfestival.com/.